Virtual world of the internet now has become one of the major media of communication across the world.Similarly the number of Internet users is growing worldwide and it has reached 2.27 billion,almost exactly twice what it was in 5 years ago,1.15 billion.It is known to all that the Internet is big,but this kind of growth really puts things into perspective. Today I am going to give an account of the world population of the internet users and the growth of twice in a gap of 5 years.The Internet population has been swelling rapidly since the arrival of the World Wide Web (www).It is human nature to get used to changes ,so most of us have a tendency to forget how rapidly the world has changed,and keeps changing.And as the Internet population grows,so does the potential size of online services.One example of this extreme evolution is Facebook.Last year we noted that Facebook now has more users than the entire Internet had back in 2004,the year the social network was founded. 1.Africa has gone from 34 million to 140 million,a 317% increase. 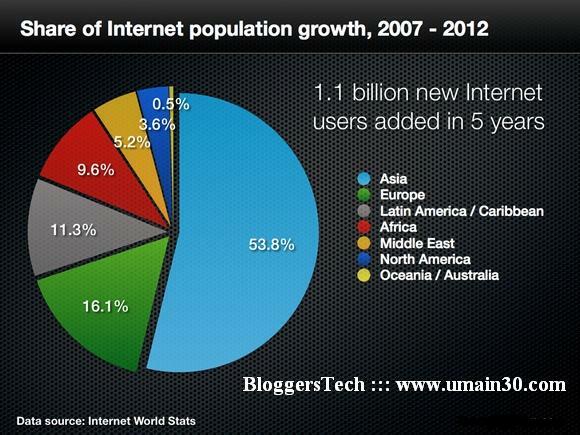 2.Asia has gone from 418 million to over 1 billion,a 143% increase. 3.Europe has gone from 322 million to 501 million,a 56% increase. 4.The Middle East has gone from 20 to 77 million,a 294% increase. 5.North America has gone from 233 to 273 million,a 17% increase. 6.Latin America(South & Central America)has gone from 110 to 236 million,a 114% increase. Oceania (including Australia) has gone from 19 to 24 million,a 27% increase. 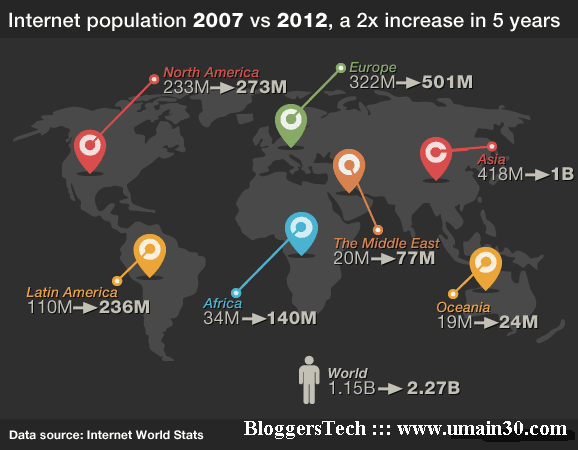 Asia’s Internet population is now almost as large as the entire Internet population was 5 years ago.Looking at just relative growth,Africa and the Middle East have increased the most,quadrupling the number of Internet users in each region.2012 heralded two nicely even milestones.Europe passing 500 million Internet users,and Asia passing 1 billion.Europe is now twice as large as the United States in terms of Internet population. After reading this article,you might ask yourself if the Internet population doubles every 5 years?Kind of a Moore’s Law for the Internet.There is actually a kind of Moore’s Law for the Internet which states that the Internet doubles in size every 5 years,but it refers to infrastructure and not people. This was reported back in 2009,a discovery made by Chinese researchers.To see if something similar applies to Internet user numbers,we’ve examined Internet population changes from the past decade,and it does seem to indicate that we are following this pattern,at least roughly.For example,the jump from 2002 to 2007 was also roughly a doubling of the number of Internet users.That said,this is not really a law that scales.We are limited by the actual world population,which is not growing at the pace necessary to maintain such a trend in the long run.If we assume it works until every man,woman and child on the planet has Internet access,we would reach the limit before the end of this decade. Though,it looks to be a rule of thumb we can use when trying to make future estimates,as long as those estimates are not too far into the future.After all,only one third of the world’s population has access to the Internet today.Just wait and see the what next! !